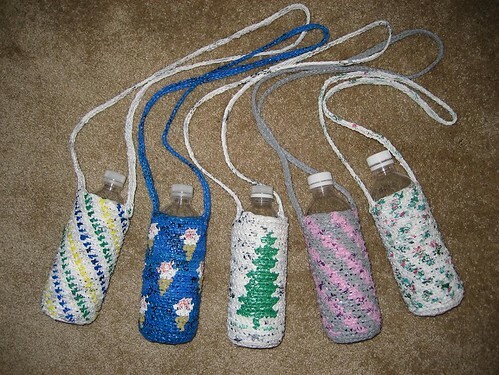 I am sharing a reader’s designs and crochet pattern for a plastic water bottle carrier. These water bottle carriers are made from recycled plastic bags and have been fashioned into some amazing designs by Cecile Chi. Cecile has allowed me to reprint her pattern and photos in this post. Her designs are beautiful and shows how plastic trash can truly be transformed into treasures. While she doesn’t give all the details for creating the special designs shown in the photos, her beautiful creations do provide us with numerous ideas for crocheting our own unique designs with recycled plastic bags.